Since I wrote the last diary update on here on the 27th May, i was afforded a luxury that those on the run in 1943 were not. A family emergency cropped up and, just like that, I was able to return home. Crisis averted (Lily the Border Collie has pulled through and made a recovery) I am about to return to complete the unfinished Journey. Before i set off, i was scouring the internet for additional research and came across this book, ‘A Second Life’ (http://www.tolepress.com/reviews/). It tells the story of over 200 persecuted people, locked up in a camp along the routes I am about to follow. It also tells the story of their escape and bid for freedom, along the same route the soldiers took. I hope you’ll continue to follow the story of James and Douglas as it continues to unfold, starting again this Wednesday, 13th June 2018. In the meantime, below is a summary of my journey so far. 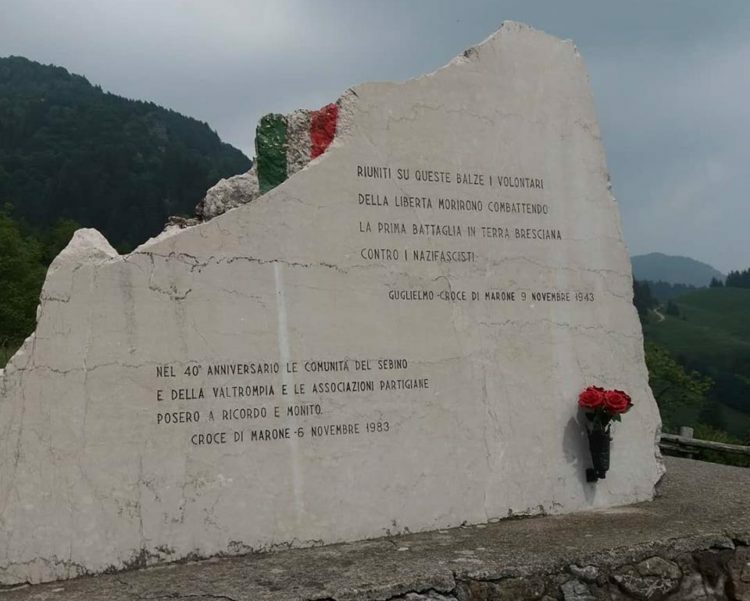 A monument to the battle between the partisans and allied soldiers (all ex POW’S) who fought the German soldiers sent up to the Croce. Fatalities were taken on both side. The Partisan leader, Tenente Martini, was incapacitated due to influenza (remember it’s November at 1200m an there’s no heating!!) And ultimately everyone had to make a fighting retreat. On the 10th November, Tenente, succumbed and passed away. James then began rounding up the scattered pow’s and decided to head to Switzerland. He had with him another Englishman, 2 Americans, yugoslas, Russians, a cypriot and a Senagales! Heading north there paths converged with Douglas Clarke’s route near Monte Polar, 2500m. That’s where I’m heading tomorrow. 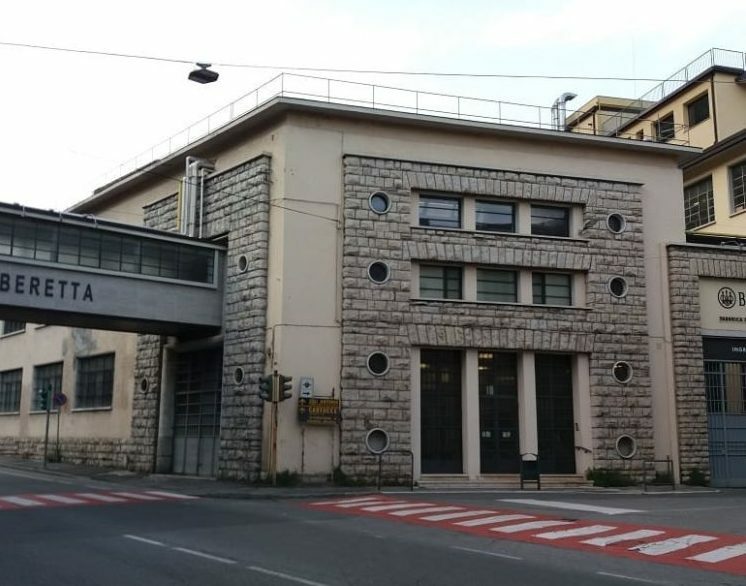 Shortly before James joined the partisan group that had formed at the Croce d.Marone, raided the factory stealing arms and ammunition for the fight ahead with the Germans. The Croce d.Marone is a collection of rifugio’s and farm buildings high on the mountains between Gardone and Lago Iseo. 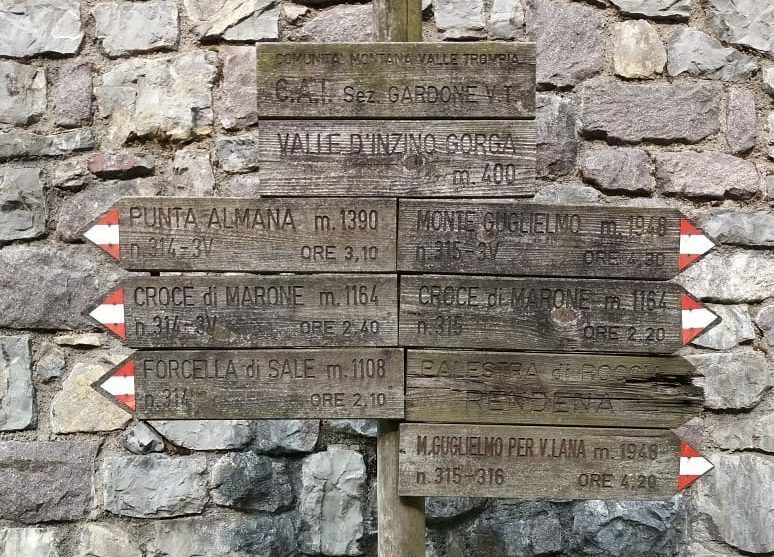 The map picture has dots marking Gardone, Croce d.Marone and Marone, where German forces arrived by train to assault the Partisan base. On the opposite side of Lago Iseo is where Captain Douglas Clarke and Lt Johnny B. Landed at Tavernola after rowing across the lake from the southern shore as their ‘quieter’ escape continued. Douglas has been a prisoner at Fontellanato, between Bologna and Parma in the plains of Italy. On the 8th September 1943, when the camp guards desert, Douglas is straight out the gate with his friend Lt. Johnny B, Royal Artillery. They have a small haversack each with some personal belongings, the uniform they are wearing and a Red Cross Parcel of tinned beef! Progress is slow at first, initially they only travel 5 kilometres before laying up with an Italian family who, at great risk to themselves, offer them a bed for the night. Due to rumours spread within the camp at the time of the Italian surrender and the issuing of a ‘Stay put order’, over the BBC, by an ambitious military machine (who didn’t want thousands of soldiers running everywhere, and perhaps thought the Germany Army might withdraw) no one really knew in which direction to head. Eventually Douglas and Johnny settled for heading north to Switzerland, a shorter and less dangerous option than heading all the way south. They were lucky and Douglas reports that they had no ‘serious encounters with Germans or Italian fascists on the estimated 120 kilometre to the southern tip of Lago Iseo, about 20 kilometres West of where James is still hiding some 3 weeks later, at the end of September. As this should have been posted last night (sorry, no signal) check in later for an update for where I am on the trail and what the escapees are doing..
Today, I’ve embarked on my third ‘Freedom Trail’. This evening I am in the mountains West of Lake Garda, in Lombardia, Northern Italy. Let’s get a ‘Sit Rep’ (Situation Report)from our two escapee’s and find out how they came to be in this area. Captain Knox first. Captain Knox, captured during the fighting in North Africa, has initially escaped from prisoner of war camp on the outskirts of Bologna, along with the camps senior British Officer, Brigadier Mountain (what a fantastic name for this story!). Unfortunately they are recaptured just outside the camp perimeter as the German Army promptly takes control of POW camps from the Italians, many of whom disappeared when the Italian surrender was announced. In the scramble to get out there is one casualty: Capt Philip Johnson (service number: 138943) of 9th Battalion, Durham Light Infantry, is mown down by a hail of bullets from a german machine gun. Sadly, he succumbs to his wounds the following day. He is buried in the British Military Cemetery in Bologna, under the care of the Commonwealth War Graves Commission. James and the other Pow’s are now taken by lorry to Moderna railway station and loaded into train trucks – they are to be transported over the Brenner Pass into Austria and on to Germany! Many prisoners are crammed into each of the cattle trucks being used for prisoner transport. James is placed in an older wooden truck and so the occupants start to pull up a part of the wooden floor. By the time the train reaches Verona, they are ready to jump. They’ve drawn lots and James is number 2. He ‘jumps’ just after Verona, before the train gathers too much speed. Landing in a ditch at the side of the track, he is elated to see the red signal light on the back of the last carriage, fade into the distance as the train continues. He begins the march West along the southern shore of Lake Garda, lying up during the day and moving at night. He is still in his battle dress and carrying only a small amount of rations, from a Red Cross Parcel. He also has a hair brush, a comb, 2 tablets of soap, 100 lira, a Palestine Pound and a roll of toilet paper! Passing the Italian Air Force sea plane base at Desenzano he is confronted by a young German Army guard. The guard tries to question him, but fortunately, knows less Italian than James, who bluffs his way by, still wearing most of his uniform!! James continues north west after the lake, to the village of Gavardo. He starts to climb up into the mountains. The same mountains where I am tonight. 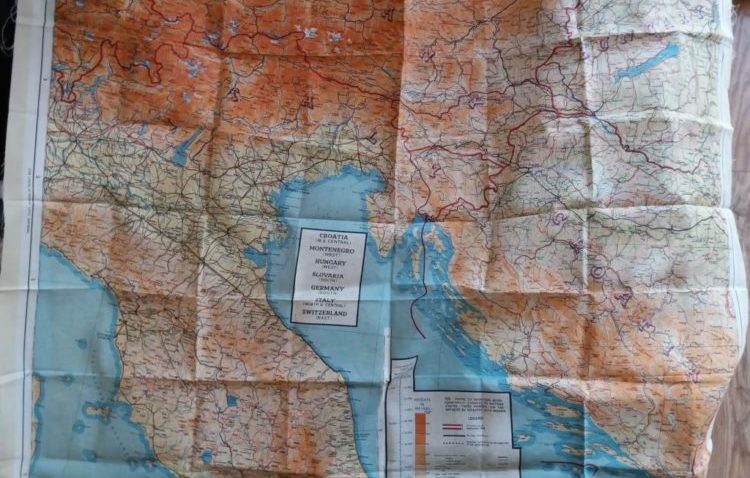 WW2 Secret Maps – this silk map, is designed to be sewn inside a pilots jacket or hidden inside a games board and sent to allied servicemen in Prisoner of War camps. Next week I will be using this as an aide as I land in Italy to follow the escape routes of Captain Douglas Clarke, Royal Army Service Corps and Captain James Knox, Royal Artillery. After the Italian armistice in 1943, one escaped from his camp and the other leapt from his prison transport train near Verona, northern Italy. To find out more and to see if they made it to neutral Switzerland follow the Alpine Walks Facebook page from Wednesday 23rd May onwards.